Fast Eddie Chambers went to Dusseldorf, Germany with a fight plan to beat world heavyweight champion Wladimir Klitschko, but his dream to bring Klitschko's collection of title belts back to the United States fell short. A frustrated Klitschko suddenly capped his one-sided 12-round performance with a thudding left hook to the side of Chambers' head that ended the bout immediately. Chambers, who failed to win a single round against the bigger, stronger, and more accomplished champ, sagged into the corner post and then toppled sideways over the bottom strand of rope. Referee Genaro Rodriguez did not bother to count. The time was 2:55, just five seconds before the final bell. The 51,000 fans who packed the ESPRIT Arena were loving it. Leading up to the knockout blow, the fight was all Wladimir Klitschko, who proved once again that he is the best big man in the game today. 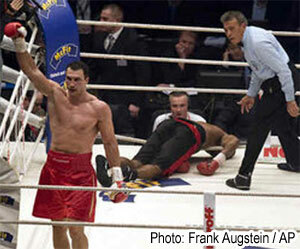 Klitschko controlled the fight with a very potent left lab and straight right hand. Klitschko landed the combination all night long. He hurt Chambers a few times, especially in round two when a hard right hand staggered and almost dropped the challenger. But it did not appear that the champion would be able to deliver the KO, until those final, fateful seconds of the bout. Chambers, for his part, tried his best but was never able to put together a serious enough offense to slow the champion's progress. Klitschko banked round after round as the fight elapsed, diminishing any chance of a Chambers victory, which was never likely to come by KO. As Klitschko's advantage in the fight grew, his trainer Emmanuel Steward became more and more frustrated with his fighter. He repeatedly admonished the front-running champ for not stopping Chambers. Even with eleven rounds already to Klitschko's credit, Steward refused to let him settle for a lopsided points win. Before the final round began, Steward demanded that his fighter pick up his pace and go for the kill. You rarely see this commitment to finish big these days. It is even more rare to watch a fighter go out and follow those instructions. Klitschko definitely stepped on the gas in round twelve, but a badly tiring Chambers seemed to have enough defensive skill to lead him to the final bell. But it was not to be. As the round wound down, Klitschko casually backed Chambers into the corner and let fly the final punch, a left hook. It crashed against Eddie's temple, just as his fans were consoling themselves with the fact that their man would at least last the distance with the dominant champion. When the blow landed, it was crushing, and served as a slap to the face of all those who dared to think that Chambers came in with a chance of winning. It was heart-breaking. Not in the way Meldrick Taylor's loss to Chavez was (with just two seconds left in their first fight). That ending was a robbery that ruined a fine fighter and turned our stomachs. It made us wonder why we love this sport. The loss by Chambers was nothing like that. But it still wrenched our emotions. There was a selfish little sting because we didn't get what we wanted - the heavyweight title back in Philly (and America). But the majority of the pain was for Chambers, a guy who earned his shot at Klitschko in the ring, and was sent in to accomplish a task that very few can pull off. We were saddened at the cruel reality that our guy - the kid we watched grow up at the Blue Horizon - had defied the odds, talked the talk, believed in his chances, prepared himself well, and did his best, only to fall, just as the 8-1 betting odds predicted he would. The world of boxing is a cruel one. Further, the lack of media interest in this fight, and the fact that no TV outlet chose to broadcast the bout, were insults to the great story of Chambers' successful climb into contention. Somehow the fight's end result - with Chambers lying on the canvas - helped to validate these slights. But they were still wrong not to care. Watching this all unfold really hurt. Seeing Chambers' only consolation evaporate, with just seconds remaining, hurt. And wondering what Chambers was feeling and trying to imagine where he goes from here also hurt. But it was also good and clean and clear. An emphatic win for a deserving champion. Chambers came with a game plan. But in the end, to leave with a victory, Eddie needed something more. Plain and simple, it was something he didn't have.